STILLWATER, Okla. (March 3, 2015) - The Oklahoma State University Alumni Association and Homecoming Executive team have unveiled the theme for OSU Homecoming 2015. This year, OSU alumni, students and friends will celebrate ’Stillwater, Still Loyal, Still True&apos; at "America&apos;s Greatest Homecoming Celebration." 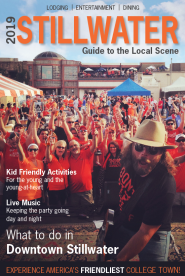 “Stillwater is a special place for every OSU graduate,” said Jimmy Hutson, Homecoming executive director. “Our college experience is shaped not only by our time on campus, but also the memories we create in this great community. No matter where we travel, Cowboys remain loyal and true to Oklahoma State and our former home, Stillwater, and there’s no better time to celebrate that than Homecoming." The selection of a theme begins each year in January when the ten Homecoming executives hold a retreat to brainstorm ideas. Once a theme is selected, it is kept under wraps until the first Homecoming Steering meeting in March, which occurred Tuesday evening. “Some years, it takes several hours to come up with the theme,” Hutson said. “This one was mentioned early on during our retreat, and we kept circling back to it. &apos;America’s Greatest Homecoming Celebration&apos; is as much about returning to Stillwater as it is OSU." Homecoming 2015 is Oct. 16-24 and will conclude with the Kansas vs. OSU football game on Saturday, Oct. 24. Kick off time has not been set. “America’s Greatest Homecoming Celebration” has been presented each year by the OSU Alumni Association since 1920. It is run completely by more than 250 Homecoming student members with the collaboration of thousands in the Greek, residential life and student organization communities. Visit orangeconnection.org/homecoming for more information about OSU Homecoming 2015 and the Homecoming and Student Programs Endowment. Stillwater travel and lodging information is available through the Stillwater Convention and Visitors Bureau at VisitStillwater.org. The OSU Alumni Association serves as a lifelong connection between alumni and Oklahoma State University. As a member organization, the Alumni Association serves more than 200,000 alumni living worldwide, as well as OSU students, faculty, staff and friends. By supporting the extensive alumni network from OSU, the Alumni Association provides a connection back to the university through a number of outreach programs as well as a complete directory to connect alumni to each other. Get Connected - Stay Connected - orangeconnection.org!